What will sustainable houses of the future look like? I’m eager to hear what readers think sustainable houses of the future will look like. Please give us your input. In your opinion, what are some exemplary sustainable houses that will guide home design in the future? Key considerations are affordability (hugely important), DIY owner-builder friendly (easy to build), small, space efficient, highly livable, nontoxic, adaptable, renewable energy, extensive use of recycled materials, and of course beautiful and appealing. Our natural building blog now has over 2,700 blog posts that showcase many excellent homes that fit this category. But just for fun I thought I’d put forth one more example. 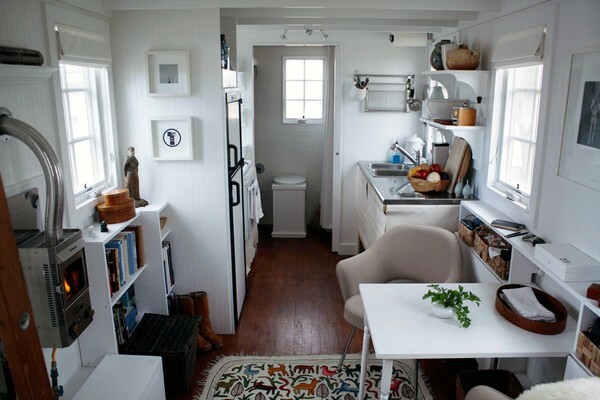 The photo above of the ProtoHaus tiny home is an example of excellent design. If owner-built with a high percentage of recycled materials then this home would be quite affordable. For example, take a look at Tiny Texas Houses for inspiration on how to use recycled materials. (Some of their plans are free.) Building your own home enables you to build it just the way you want as well as save a substantial amount of money. Note how well designed tiny houses have all the modern features home owners want while keeping the environmental footprint very small. This design challenge got me thinking about future sustainable careers for those who live in these mobile tiny homes. There are lots of possibilities since your cost of living would be greatly reduced, and you’d have freedom to move around and try different things. Some people might want to experiment with digital nomadism. Others might want to gain hands-on experience in sustainable farming and natural building through WWOOFer apprenticeships. Once the necessary skills are acquired, you could live temporarily on rural jobsites or nearby campgrounds and help other people build their sustainable homesteads. This type of right livelihood would provide a decent income, travel and adventure while not wrecking the environment. Search tip: Search our blog by using the Design category for information about home design. Or do keyword searches. Smaller homes that are well insulated.Straw bale or earth bag with lava rock. Bathroom outside in small separate building or something simple. Outside kitchen as well.Keep the heat out. I’ve been thinking about designing something called a “Survival Pod” that would assure the owner/occupant that hopefully most of his or her basic living needs would be taken care of. This would be something portable that could be set up in a variety of localities, depending on the exigencies of both environmental and social climates. This means that it would have to be pretty small. It would utilize passive solar concepts for both heating and cooling; thermal mass could be in the form of a large water bladder that could also provide extra water when needed, or could be emptied when the Pod is being transported. It would have its own roof-mounted photovoltaic system with batteries and inverter to provide all needed electricity. I would expect there to be a small wood fired heater, perhaps Rocket Stove, that could provide both heat and cooking as needed. A simple solar shower would be nice. There would be room for a well stocked pantry with lots of dried or preserved food for times of food shortages. In addition there would be seeds for planting more vegetables or making sprouts, and a good place for the sprouts to grow. Ample room for basic hand tools should be provided, along with some basic materials for mending clothes, etc. Of course there would be a comfortable bed, and the basic furniture expected for a comfortable life. I have designed and built quite a few mobile habitats that come close to this ideal; all of this is quite feasible, and could be accomplished with a minimum of materials. For those who don’t move around much, I’ve been thinking of a tiny house that’s not on a trailer. Trailers add thousands of dollars to the cost. Instead, build the tiny house on a sturdy timber or steel platform and design it so it can be slid off a truck onto blocks or other suitable foundation. As an American digital nomad who sold it all and traveled in an RV with my wife and 2 kids, I’ve already talked to a lot of people yearning to take their jobs on the road. So many people said I was living their dream. I imagine this desire increasing while the necessity for efficiency continues with more sustainable practices and instant commerce takes a fuller shape. Thus forming more community-based neighborhoods who sustain their own communities, but trade very commonly with everyone everywhere. Both the traveler and the community man need less space because more is shared. Couple that with your comment about people realizing more space = more energy consumption. I think the Tiny House concept is cool, but I think many people need space. I don’t feel most people will continue the tiny home trend, rather, aim for efficiency and smart design. The dome shelters are great, but not everyone likes a dome, and a lot of people will still be about aesthetics in the future. Why shouldn’t they be? I honestly think our best option is earthbag building and cob homes. Cob homes have lasted for centuries in the UK. They have the versatility, the beauty, the small cost, the ease of approach. I want it to be approved by code, but if the banks tank like so many have said they will, then financing will have to be thought of differently, and people will have to make due with the abundance they have beneath their feet, and give little thought to “the code”. As far as examples, my friend Morgan is doing it. He’s started a community and is building his earthbag earthship. Idk about Morgan’s specifically, but the Earthship design has a lot of great design cohesiveness, coupled with the cost and strength of earthbags, it doesn’t get much better. That community I believe, is the future because it’s one example of a movement that has already started in small numbers. I would share the link to his Facebook group, but I’m not sure how public he wants it. Any earthship design points to the future in my mind because the idea is centered on sustainability. Contain all the systems, be completely off-grid. To not owe anyone is an enticing concept for anyone, especially after we Americans start collectively realizing how much we owe to others. TL;DR – Earthbag-Earthship designs are the best because they’re the most affordable, beautiful, and sustainable. Interesting ideas. Thanks for sharing. 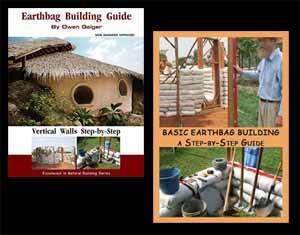 How about a a starter micro earthbag earthship that’s easy to expand over time? That way the costs and labor are manageable when starting out, and yet owners can expand and incorporate all the great renewable features as they have time and resources. What is the ideal size for a starter home in your opinion? Note how there’s already a growing trend against large homes. People are realizing big isn’t necessarily better. Big homes require a lot of upkeep, use a lot of energy and of course are very expensive. I think more and more people will choose smaller, more well designed, better insulated homes.